Gooseberry Shortcake was my Mum's signature cake and a firm family favourite. I think of the gooseberry as a signature fruit of the South around Christmas. It's something we can grow really well in this climate and it has so many delicious uses, both sweet and savoury. 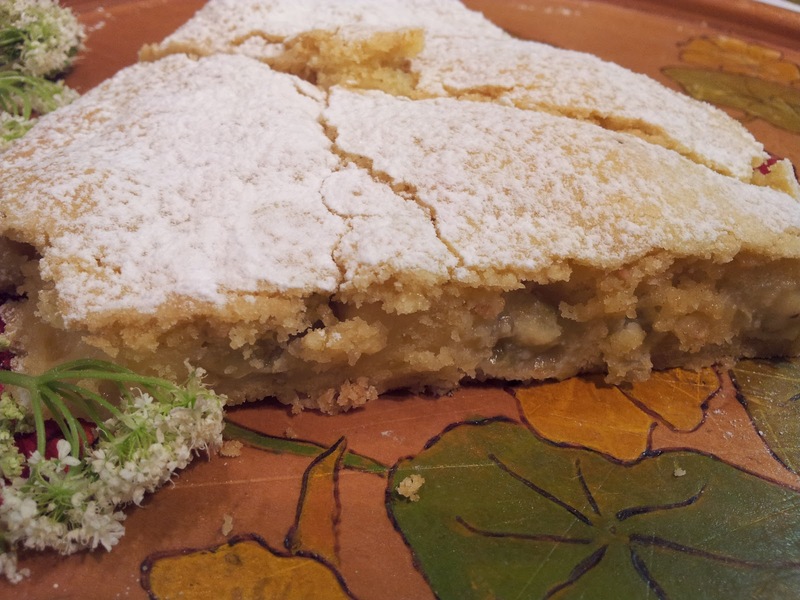 I presented this family treat to book club and everyone loved it, so I am sharing the recipe with my book club friends and anyone lucky enough to have gooseberries. This was made using last year's gooseberries - they freeze really well. You can spend time head and tailing them before freezing but I usually do this when I use them out of the freezer, because who has time to do this around Christmas time? They should be picked green for cooking. The red gooseberries are good left to ripen and be eaten raw. Put oven on at 150 C.
Beat in eggs one at a time and a dash of vanilla. Gently mix in the shifted dry ingredients to make a dough. You might have to add more flour, or if it is too stiff then add a little milk. It is a very soft light dough so rolling out can be tricky until you get used to it. 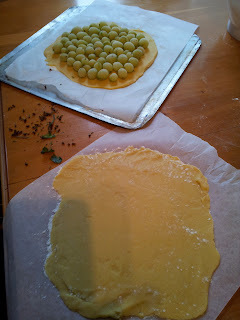 Divide the dough into two pieces - put down some baking paper on a tray, sprinkle with flour as the dough will be quite sticky and roll out into a circle about the size of a large dinner plate - place the still frozen (or fresh) gooseberries onto the dough as below. Next roll out the top of the shortcake on another piece of floured baking paper making the top slightly larger than the bottom. Now comes the tricky part....You have to with confidence flip over the top to place on top of the gooseberries, then gently peel off the paper. Next crimp the two layers together around the edges and with a fork finish the edge with the lines of the fork. Prick over the top of the shortcake with a fork and place in the oven to cook long and slow - about 40 minutes at 150 C. When the cake top is no longer shiny it usually means it's done. You can use any other fruit - the key is to avoid putting sugar onto the fruit as this makes the cake soggy. To serve sieve icing sugar over the top - cut into squares or wedges like a pizza. This can be an afternoon tea treat or served as a dessert with whipped cream and it successfully fed a crowd of 12 at book club. It has to be eaten that day because the gooseberries make the cake soggy eventually...unless you like it soggy. Variation: You can replace a little of the flour with some ground hazelnuts or almonds to add to the texture. Gooseberries are easy to grow and they tend to be quite expensive to buy. Perhaps it is because their nasty prickles make picking a chore. 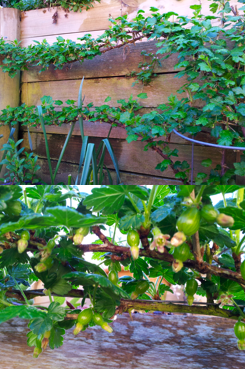 My sister Kerry has come up with a great idea of easy picking with espaliered gooseberry plants. below: the tiny new fruits - how easy they will be to pick! 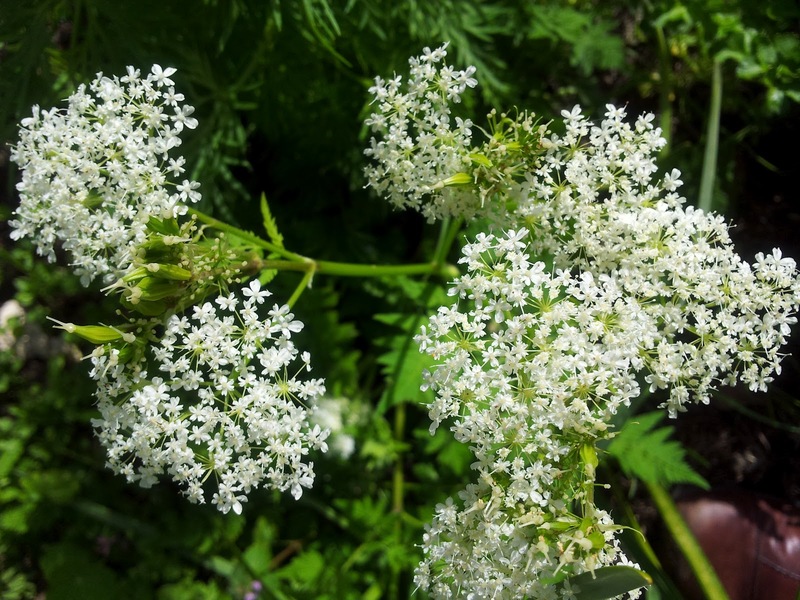 What a sweet herb this is - you can use sweet cicely when cooking fruit to halve the amount of sugar used and is excellent with tart fruit such as rhubarb and gooseberries. Chop up the leaves to sweeten up a salad - especially good in a salad with its cousin, the carrot. But you have to be careful! It looks similar to its poisonous cousin, hemlock. Hemlock is a darker green with sometimes blotches of purple on the stems, not a soft green like sweet cicely. When you crush the leaves of hemlock it smells pungent and unpleasant, whereas sweet cicely has an aromatic aniseed odour. Once you know it is sweet cicely chew on a flower stem - its like eating those old fashioned aniseed balls. All parts of the plant including the carrot-like root dug up in autumn are edible. 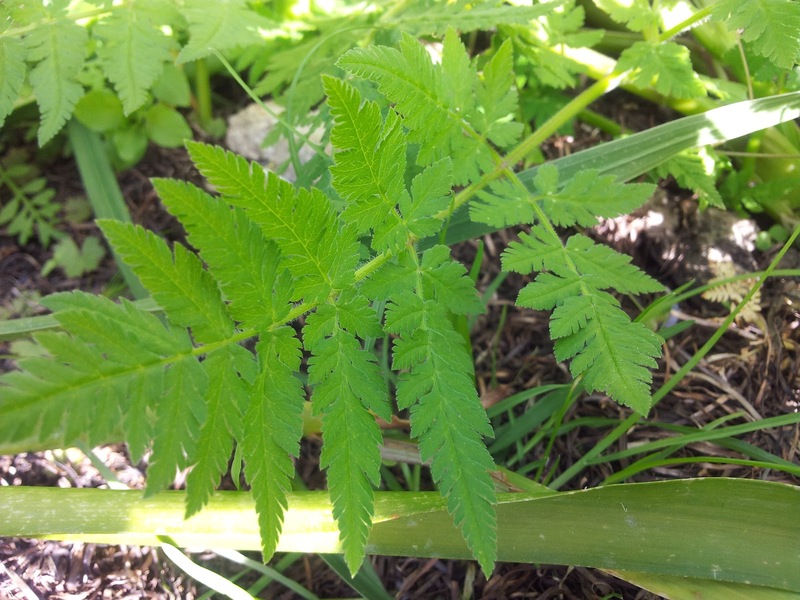 Sweet Cicely is a useful herb for the kitchen and a pretty plant to have as a spring-summer feature in the flower garden. It prefers a semi-shade position with free draining soil. 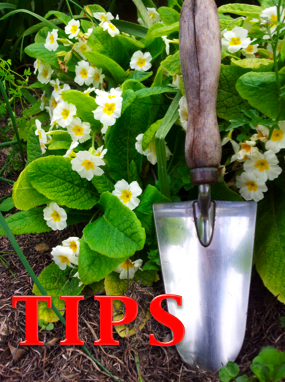 Here's a good suggestion.... plant it inbetween rhubarb plants - making it convenient to harvest at the same time as rhubarb for use in the kitchen. It can grow up to 1 metre high and dies down in winter. Herbalist Culpepper says, the roots or the leaves of Sweet Cicely can be made into a herbal tea. It has the reputation of aiding digestion, dealing with flatulence, easing stomach upsets, and may help with menstrual pains. It was used as a protection against the plague. The seeds can also be chewed to help digestion. It was one of the herbs used by Benedictine monks to make Chartreuse. Herbs inspired me to garden. I started using them for cooking and was rewarded with the flavour improvement in my food. I wanted to learn how to grow them. Then I discovered the folklore, the uses our ancestors had for curing themselves of all sorts of ills, and the stories of how people for centuries used these plants. For my friend Cecylia, I just had to include in my posting that sweet cicely is associated with St Cecylia and was strewn on church floors to add fragrance. Cecylia, you will now want to grow this plant not only for its sweet uses but for its name. I will leave you with a beautiful image of St Cecilia. Yours was in the Didyoumean's (google) selection. Looks nice. Thanks for sharing.